One of the great privileges of blogging is becoming acquainted with men and women from across the world that I would not normally know were it not for the Internet. One such person is Judy Scott Brandon, Ed.D. Judy is a wife, mother, former public school teacher and university professor. She is a Southern Baptist who over two decades ago chose to set aside her professional career for a season in order to stay at home and raise her children. An opportunity arose to write a weekly column in her local newspaper, The Clovis News Journal, and for the last 25 years she has been a columnist read by thousands of people in her home state of New Mexico. 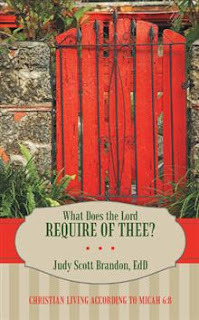 Judy's book, What Does the Lord Require of Thee? is based on those newspaper articles. The first portion of the book consists of stories and essays of what it means for Christians to live and work for justice. In the section entitled "To Love Mercy," the reader is introduced to Strange Guy, and the inner joy that comes from showing mercy to friends and complete strangers. The third and final section entitled "Walk Humbly with Your God" is filled with colorful anecdotes that illustrate the importance of humility in the believer's life. Judy's writing is precise and fresh. She possesses the unique ability of writing with self-deprecating panache and humor. The book is composed of stylistic easy-to-read essays that grip the attention and sustain the memory. All believers, both males and females, young and old, will benefit from Judy's wisdom and wit. Thanks for the review on this book, Wade. What did you see on TV yesterday that involved a tail and a nose that paid me over $300,000? You’re right if you guessed the 747 tail and the Space Shuttle nose-cone. I flew many times to Japan wondering if any of the tail was from the years of my working as a machinist at LTV. As a Cad-Cam tool designer on the Stealth Bomber, I was given the nose-cone job with words, “We don’t care how long it takes…just get it right.” It was the hardest job I’ve ever done.